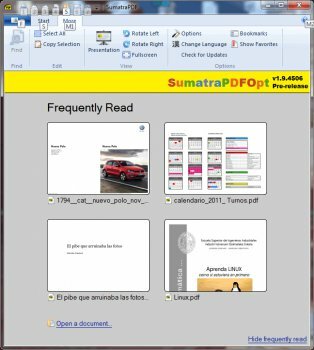 Sumatra PDF is a slim, free, open-source PDF reader for Windows. Portable out of the box. Sumatra has a minimalistic design. Simplicity has a higher priority than a lot of features. It's small and starts up very fast. It's designed for portable use: only one file so you can run it from external USB drive. Doesn't write to registry. 2) The optimised builds do not seem to have been updated in a while. 3) They are pointless as the original is perfect. Excellent free software, small, fast & no added junk - Perfect for most users! IMHO _THE BEST_ PDF reader, lean, mean and just does the job it is designed to. This is good software. WTF is wrong with white and gray? I second ballyhairs on that. But still, lite and free. My favorite PDF viewer. it also opens extremely complicated electronic schematics with no problems. Brilliant. I think the function of a reader is to be "basic". To let you *read* something quickly and efficiently as the name says - "reader". ;) So I find it absolutely fantastic and it loads instantly the PDF I want to read, it scrolls fast to the page I want to read. What else do you need? This is perfect and I'm afraid the unnecessary features from bored users who don't have to read a hundred of PDFs per day would make it slow as they made Adobe Reader slow and lately even my favourite PDF reader before this one - Foxit Reader. The only feature that is also required is copy and paste text or a picture... and that's it. What would you like it to do? To have painting tools or play video? ffs... it's a READER. I wrote a review in "normal not-optimized" official build, but I've tried this one x64 optimized. Crashes when I'll go to "change language" in menu. Appart from that, it is _very_ basic PDF reader. Sooo many features are lacking that it is not even funny. I agree with 'ballyhairs' bright yellow is a bit much, sunglasses are required. Maybe a more subtle colour would also make it look less amateurish which yellow does. Apart from that I'm happy with Sumatra. Something is wrong with the author! Or screeming yellow startup background, or red ones, immediate headache. Whats wrong with white? Gray? This is the second time I want to try this thing, no third. MSVC2010 has a bug where it generates SSE2 for x86 with SSE specified. This is fixed in MSVC 2010 SP1 Beta. So even the SSE x86 build requires an SSE2 processor unless MSVC2010 SP1 Beta is used for compilation. Plumber, are you sure your old desktop supports SSE enhanced instruction set? Optimized... Hilarious. I downloaded the SSE version for my ancient desktop, and the PoS crashes whenever I run it, even when simply running it directly.